A critical component of fostering women’s advancement is knowing true male engagement when you experience it. Engagement can be viewed from an intercultural competence perspective. Intercultural competence can be measured using The Intercultural Development Inventory® (IDI®) and is based on the Intercultural Developmental Continuum pictured above. Intercultural competence is the knowledge set, skill set and tool set to work effectively across cultures. The IDI® assesses the capability to shift cultural perspective and appropriately adapt behavior to cultural differences and commonalities. It is a 50-item questionnaire available online that can be completed in 15–20 minutes. A wide range of organizations and educational institutions use the IDI (click here to view a number of organizations using the IDI). The Intercultural Development Continuum is grounded in theory, research and evidence to explain predictable stages people go through, based on their intercultural experiences. The model can predict one’s ability to communicate effectively and appropriately in a variety of cultural contexts. The journey of intercultural competence is from a Monocultural to Multicultural Mindset. The Monocultural mindset uses one – one’s own – cultural values and practices to make sense of other culture’s differences and similarities. A global, intercultural, or, multicultural mindset can view interactions from multiple cultural perspectives. The first stage along the Continuum is Denial. In this Mindset, one is comfortable with the familiar, not interested in complicating life with “diversity” and “cultural difference,” and may avoid interacting with other cultures. The business impact of this mindset is that we just plan and manage our business the same way we always have. There is no difference; everyone accepts this. And we believe we will continue to succeed as we always succeeded. The next mindset is Polarization, where one has a strong commitment to a way of thinking and about their culture. Typically, either their culture is superior or inferior. One probably has some distrust of, and discomfort with, other (cultural) behaviors or ideas. Polarization signifies a we vs. them attitude. The business impact of this mindset is that people appear so different; so confusing that they make one uncomfortable. Our wish is that others conform to our ways, like our products and services, be happy as “we” are, and stop complaining; or go elsewhere. Minimization is a transition stage from Monocultural to Multicultural. In this mindset, we are beyond feeling that other cultures pose a threat to our own. We believe that people from other cultures are pretty much like us, under the surface. Thus we minimize cultural difference. We may believe in simply following the “golden rule,” or being color, or gender blind. Thus, while all differences don’t make a difference, someone in minimization will miss differences that do make a difference. The business impact of this mindset is that deep down, because I believe we all have so much in common, I assume that I understand other people’s needs, so I do not need to ask many questions. I may have to adjust my business plans slightly; but I am confident I know how to procedure. The Acceptance Mindset, however, deeply comprehends the nature, effect, and consequences of diversity and cultural difference. One sees their own culture as just one of many ways of experiencing the world. The business impact of this mindset is that I am fully aware that people’s backgrounds are different than my own and that I need to speak with people to know their mindset so that I can deeply understand their perspectives and needs. Finally, in the Adaptation Mindset, one recognizes the value of having available more than one cultural perspective. One can intentionally change their culturally-based thinking and/or behavior to other perspectives. The business impact of this mindset, is that I know I must apply my deep understanding of other people’s perspectives and needs to shift my thoughts and behaviors to think from their perspective, develop innovative solutions, and adapt traditional ways and business accordingly. Research and experience show that virtually everyone over-estimates how well they fully understand and work with people of different cultural backgrounds! 67% of population in Minimization. 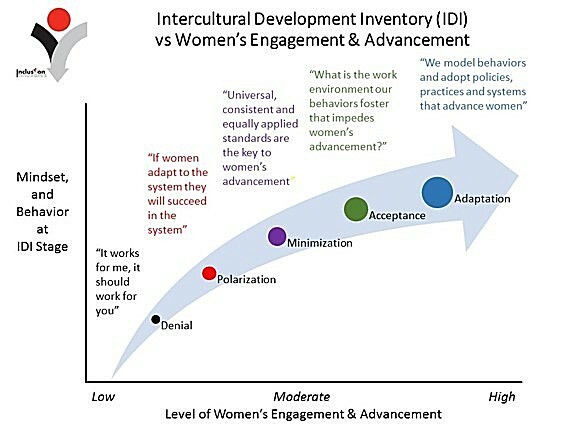 What are your thoughts on the connection of intercultural competence and women’s advancement?